He published the first magazine dedicated to ornithology. His wonderful drawings and photographs of birds are a major part of his legacy. Chester Albert Reed (1876-1912) created this barn owl drawing along with the other illustrations that were part of the Color Key to North American Birds. Barn owls are among the most recognizable and most widely-dispersed owls – they are on every continent except Antarctica. Their light, heart-shaped face and black eyes are quite distinctive. They are considered a medium-sized owl and typically measure 13 to 15 inches or 33 – 39 cm long. Their wingspans are a little over double their length. 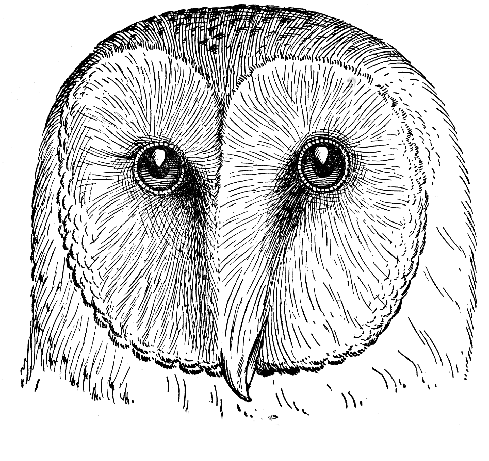 Here we have a barn owl drawing that features that distinctive and expressive face of the bird. It is a fairly simple pen and ink type of drawing and yet it feels as if the bird is actually looking at you. The lack of color does not in any way detract from the dramatic appearance of the bird.